Stephen Boccieri’s “ah-ha” moment occurred quite by accident it turns out. Stephen’s practice putting session was interrupted by a telephone call. He was leaning against his work bench at home, tolerating the delay and putting golf balls one-handed with a putter he’d covered with several layers of lead tape. Golf is the game Stephen had chosen as a respite from his day job as an engineer with world-wide construction giant Stone and Webster, Inc.
As an engineer and a skilled player, tinkering with his clubs was part of the game’s allure. Through personal trial and error, Stephen had discovered the additional weight improved his putter’s performance; however he was disappointed his “if some is good, then more is better” lead-tape theory was producing diminishing returns. At that moment, the simple science behind the fact Stephen’s club was now easier to move in a predictable and repeatable fashion became very clear to him: the back-weight at the grip end had moved the club’s balance point up the shaft, closer to him. And moving the balance point closer to the player would add the same reliable performance to irons and drivers as well! His reaction? 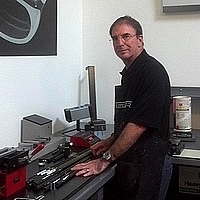 Stephen founded Boccieri Golf in 2005. Fast forward a few years to the practice range at the annual PGA Show in Orlando, Florida, where Boccieri Golf stunned the equipment manufacturing world with Stephen’s revolutionary technology. The news traveled quickly that competition-savvy professionals were driving the golf ball farther with Stephen’s Boccieri driver than they were with the new Ping®, Taylor Made® and Nike® offerings located alongside. Remember, the mantra preached by the top-line driver manufacturers in those days proclaimed “a lighter golf club is better golf club because you can swing it faster.” The manufacturers had achieved making their 460-cc clubheads as light as possible by reducing the thickness of the titanium material. Unfortunately, the competitive long-drive champions testing the drivers on the range were swinging the club so fast, the clubhead literally buckled and collapsed. “I cratered my driver” was a phrase heard regularly among groups of avid players in those days. He told them not to worry and to hit as many drives as they wished. That was the easy part. Explaining to them how they drove the golf ball farther with the Boccieri driver, and why they could swing a heavier golf club as fast as the lighter drivers they had destroyed earlier in the day was a bit more difficult. That’s the problem with common sense, it’s so easy to embrace and at times, so completely wrong. Boccieri Golf’s back-weighted product line proves you can swing it faster, if the club’s additional weight is located in precisely the right spot. The facts, rooted in physics and proved with a bit of arithmetic, are quite clear and rather elementary. It turns out that when a player swings a golf club at any given swing speed, yours or mine, his or hers, the closer you locate the golf club’s balance point to your body’s core, the faster the clubhead will travel. And the faster swinging clubhead, together with the additional club weight, produces more momentum which is delivered to the golf ball at impact. And when you put more momentum into the golf ball, you get more distance out of it. These simple facts don’t represent some unique circumstance that requires hours of practice to refine and make happen either. These things occur anytime something on earth swings, no matter who does the swinging. The likes of Pythagorus, Galileo, Newton and Einstein scrutinized such details years ago, and each of them is on record as satisfied. Now that Boccieri Golf has made this technology common knowledge in the industry, other major manufacturers are quickly following suit. Although some choose different language to describe the technology, others quote the facts rather directly. When you are ready to improve your golf game, add “investigate Boccieri Golf Secret Grip” to your to do list. You’ll find a swing tempo, solid ball contact and shot dispersion pattern you probably haven’t experienced before. The extra distance you gain, right through the bag, is fun too. 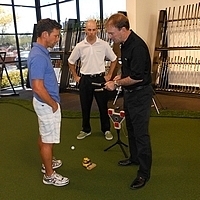 Do your homework, in person, at the Boccieri Golf Research and Performance Center in Scottsdale, Arizona. They’re located at 15816 North Greenway-Hayden Loop, just south of the Scottsdale TPC. When you visit, you’ll find a 9,000 square-foot state-of-the-art facility full of all latest swing-analysis equipment and a professional staff who knows how to handle avid players and their equipment. Don’t be surprised if Stephen, CEO and President of Boccieri Golf, walks up and introduces himself while you’re working with his staff. He’s always there, apron on, building clubs to order; a hands-on craftsman that values the opportunity to get feedback directly from the players who use his products. The latest product from Boccieri Golf is revolutionary, indeed: the new Extended Length EL Series putter. Boccieri Golf has produced the rare combination of stability and consistency in the EL Series putters and delivered to the market the first, true alternative to anchoring. The EL Series’ slightly longer putter shaft, patented, Tour-proven high mass head and 17″ long counterweighted grip produce the reliable stability of anchoring in a free-swinging putting stroke. 28 models, available in three different finishes and three custom shaft lengths means every player will find an EL Series putter to match his or her eye. When Sandra, his loving bride and former Broadway theater performer, comes out to collect Stephen and put him back on task, thank him for his diligence and then let him go. 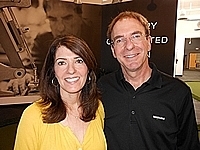 Boccieri equipment is assembled by hand and those clubs won’t build and ship themselves. The golf equipment industry has voted and their verdict says this technology is now mainstream. You can’t go visit with Steve Jobs, Karsten Solheim or several other people who started at home and revolutionized their respective industries. Stephen Boccieri, however, is front and center every day at Boccieri Golf. When you decide you want to play more enjoyable golf, go see him and his staff. You’ll be glad you did. Great article! I hope everything truly catapults for you in this phase of the Company. I’m still very proud to say I was attached to you and your (r)evolution. Stephen, thank you for bringing avid players such a simple way to make a more reliable golf swing, right now! Sure improves the benefits of the practice time I do have. I have seen Steve’s love and fascination with golf give birth to his ’baby’ the Heavy Putter and now a big happy family of support and products for other golf enthusiasts. He is the perfect example of following your passion!